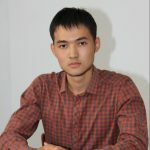 The young people of modern Kazakhstan are actually the first generation born and raised in the independent Republic of Kazakhstan. 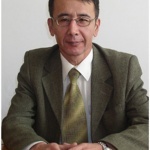 For today’s Kazakhstan, questions about what contemporary youth is and what its potential is, are especially relevant. At the same time, the practice of youth participation in the life of society shows that the younger generation has been able to adapt quickly to modern realities and looks confidently into the future. 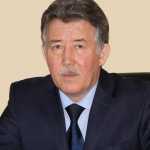 After all, the younger generation will have to implement the most breakthrough and ambitious projects, develop the innovative economy of Kazakhstan. Education for youth is a fundamental competitive advantage. And it is the university environment that creates the necessary reserve for the development of the student initiative and promotes the birth of young innovators. 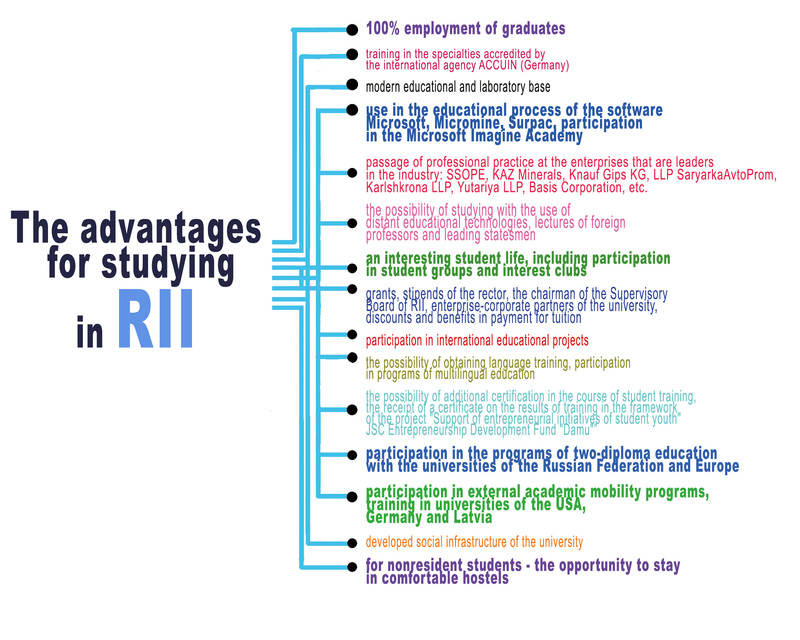 We are sure that the education received within the walls of the Rudny Industrial Institute will be a reliable investment in your future and we say: “Welcome to RII!”. 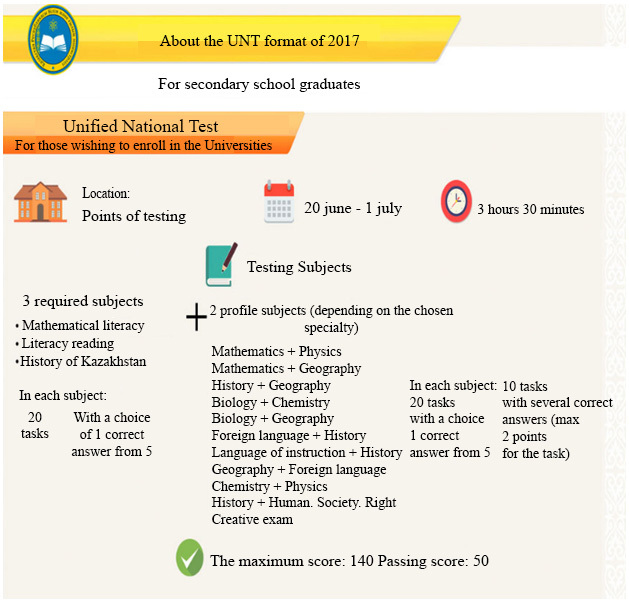 Unified national test is one of the forms of qualifying examinations for admission to higher education institutions. 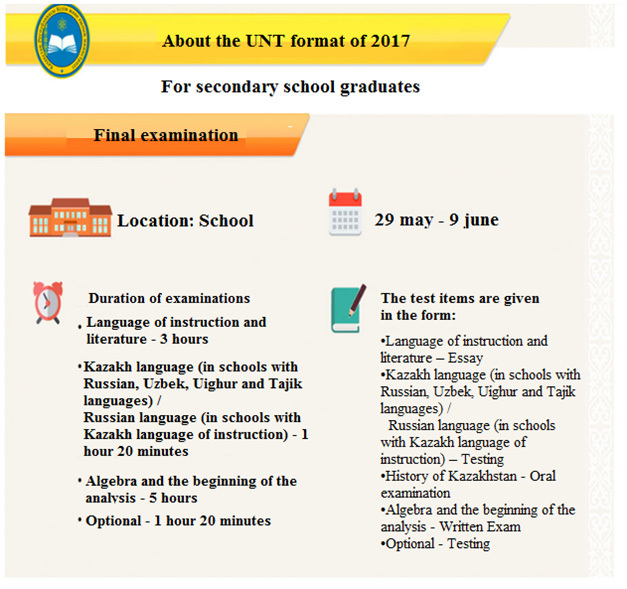 Dates: Acceptance of applications: 10.03 – 10.05. Total test tasks – 120. Total testing time: 3 hours 30 minutes (210 minutes). Profile subjects are selected in accordance with the chosen specialty in the university. 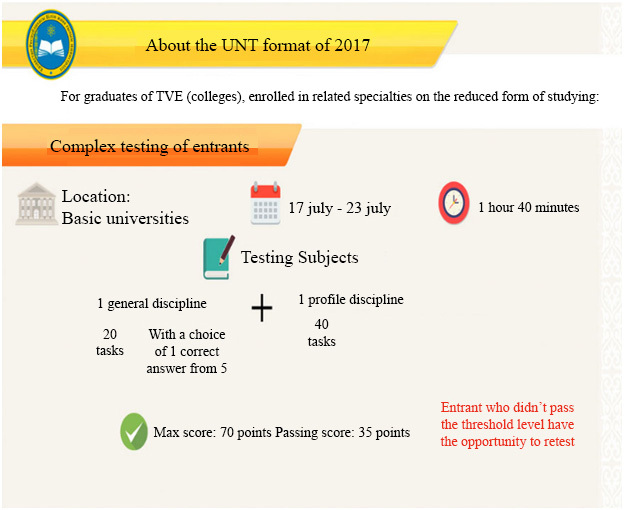 In case of failure of the passing score, the re-testing (August 2017) is provided for admission on a paid basis. Lotion: basic higher education institutions. Testing – 17.07 – 23.07. Format CTE: 5 subjects (3 mandatory + 2 optional). CTE – for graduates of colleges entering the universities on the profile of their specialty for full-time and part-time shortened forms of training. Venue: basic higher education institutions. Total test tasks – 60. 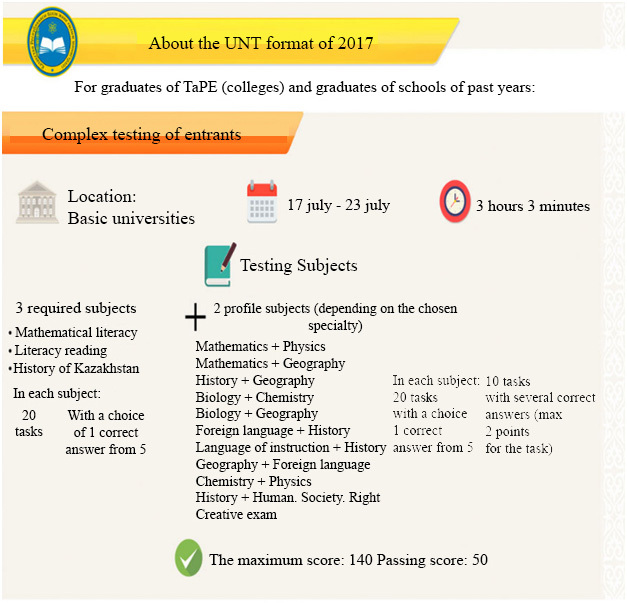 In case of failure of the passing score, the re-testing (August 2017) is provided for admission on a paid basis. Student’s educational loan can be obtained both by entrants and students of all higher education institutions of Kazakhstan in all forms of education, including master’s degree. Notarized consent of the parents (legal guardians) to receive a loan, if the borrower is less than 18 years old, as well as other documents, in the case of the Bank’s request. Possibly other documents, in case of the Bank’s requirement. 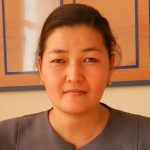 The loan is issued by partner banks, you can register in all cities of Kazakhstan. When paying, it is necessary to accurately indicate the following information (in the purpose of payment): the borrower’s last name, first name and patronymic, the number of the tripartite loan agreement, the short name of the institution where the borrower was studying.